Natural pearls are truly rare gems. They are considered to be organic because they come from a living organism. To understand the rarity of a natural pearl, imagine the thousands of oysters that were destroyed while looking for this precious gem – not all of which contained a pearl! These natural pearls are formed when an irritant, such as a parasite, enters the mollusk (oyster). In a defensive response, the oyster secretes a coating over the irritant, called nacre. Nacre looks similar to mother-of-pearl, the lining of an oyster shell. After many years and many layers of nacre, a pearl may be produced. In Japan during the late 1800’s, Kokichi Mikimoto participated in research that led to the discovery of a method to induce pearls to grow in an oyster. With many failures, and then limited success, he continued his efforts until market-worthy round and larger pearls could be produced economically. He perfected his technique, and today these engineered pearls are properly called cultured pearls. Mr. Mikimoto is acknowledged as the Father of the Cultured Pearl Industry. Cultured pearls are produced as a result of man introducing the irritant into the mollusk. Man inserts a round mother-of-pearl bead or nucleus into the oyster. A small piece of mantle tissue is also inserted along with the bead. The mantle tissue is a piece of the mollusk’s lining that surrounds and protects the living animal inside the shell. This tissue contains the necessary cells to induce nacre production. Natural and cultured pearls have been produced in both Saltwater and Freshwater. Different species of mollusks produce pearls in different environments. The cultured pearl introduced into the world by Mikimoto is known as the Akoya. This type of pearl is produced in both China and Japan, in what are known as pearl farms. Typically, it takes 8 to 24 months to cultivate an akoya cultured pearl. 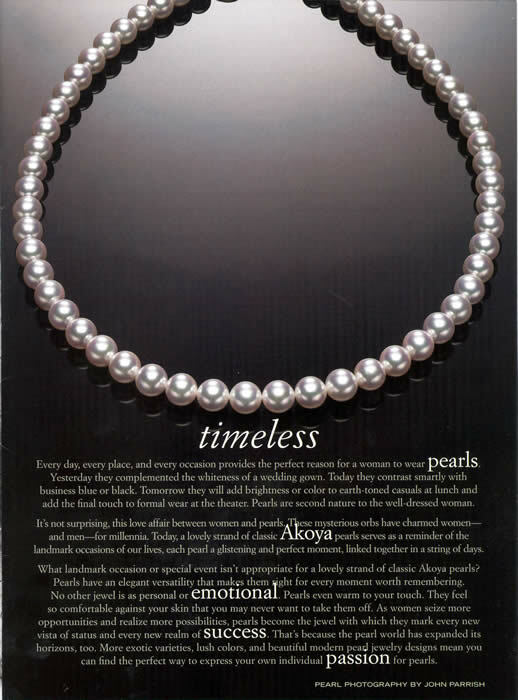 The akoya cultured pearl is usually white, cream, or gray (not black) in color and ranges in size from 2mm to 10mm. Another saltwater cultured pearl is produced in the tropical waters of the South Pacific. 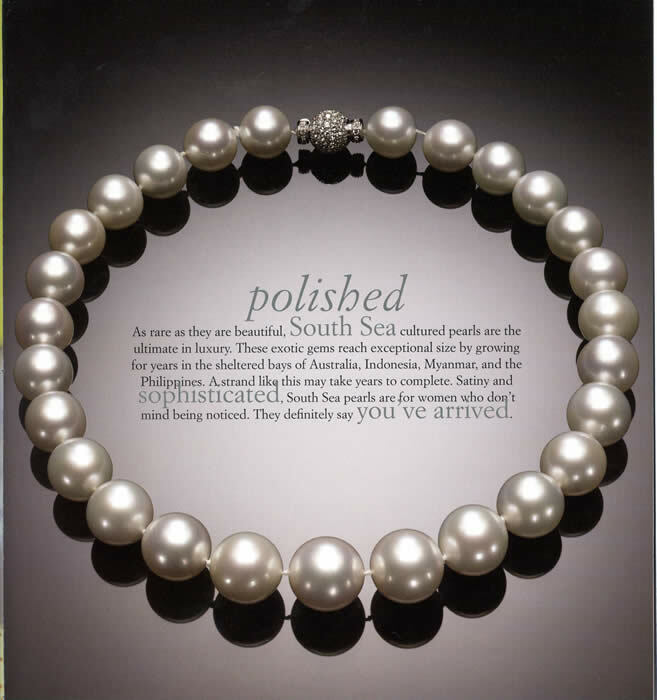 The South Sea cultured pearl can be found in Australia, Myanmar (formerly Burma), Indonesia, the Philippines and several other South Pacific countries. The mollusk that produces this kind of pearl is much larger than the mollusk that grows the akoya; therefore the South Sea is a much larger pearl. The South Sea mollusk is collect in the wild and is not grown in a controlled environment like the akoya. 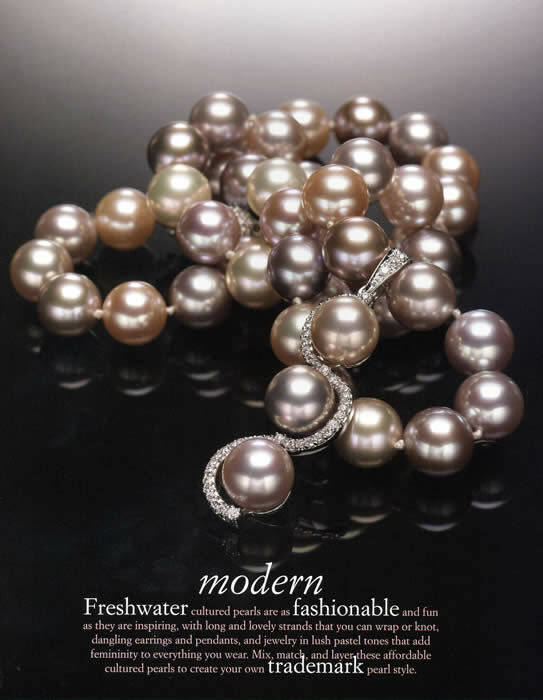 There are very strict quotas for culturing, making the South Sea cultured pearl rarer than the akoya cultured pearl. The South Sea cultured pearl’s growing time lasts between 20 to 24 months. This lengthy period of time allows the pearl to obtain a thicker nacre coating than that of the akoya. South Sea cultured pearls are usually white, cream, or yellow (also referred to as golden) in color and range in size from 10 mm to 15 mm. Some pearls as large as 20 mm have been found! In the waters of Okinawa, the Cook Islands, and French Polynesia, a cultured pearl is produced known as the Tahitian black cultured pearl, even though they are not cultured in Tahiti and are not always black. These pearls are more gray or dark gray in color, but can also glow with luscious greens, cool blues, and passionate purples. The oysters that produce these pearls are prohibited from being collected in the wild, so they are raised for the culturing process, much like the akoya mollusk. The typical culturing time is 18 to 26 months, which provides thick nacre with beautiful luster. 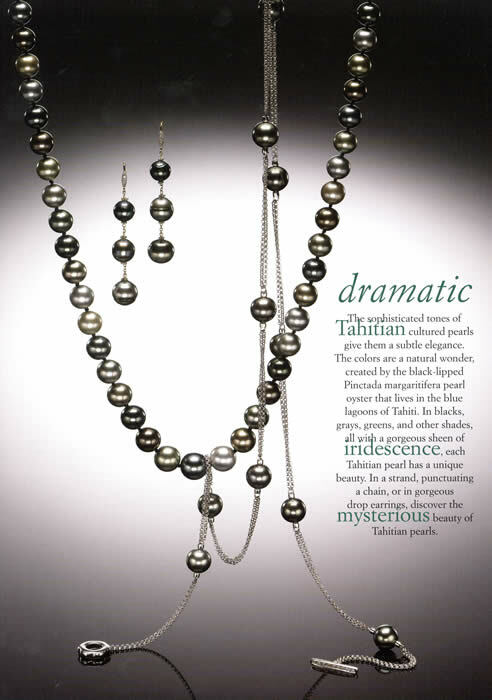 The Tahitian cultured pearl ranges in size from 8 mm to 14 mm; some have been found as large as 18 mm. Freshwater pearls are found in rivers, streams, and lakes throughout the world – most notably in China, the United States, and Japan. Several types of mussels are used to produce white or pastel-colored cultured pearls. Their sizes generally range from 4 mm to 10 mm; however, larger pearls have been produced. Many of these pearls are cultured with only the mantle tissue inserted – there is no bead nucleus – and the product is an all-nacre cultured pearl. The freshwater mussel is capable of producing more than one pearl at a time. Depending on the size of the mussel and the desired size of the cultured pearl, twenty or more can be grown on each side of the shell. Cultivation time is from 2 to 6 years and multiple harvests are possible. The freshwater pearl can come in a variety of interesting shapes including rice, potato (oval), button, bar, coin and round. These pearls are also available in many colors including white, cream, pink, yellow, orange, and purple. There are many unique types of pearls that may be produced in both saltwater and freshwater. Blister pearls form on the shell of the mollusk after a nucleus is glued onto the shell. Many shapes are created, including round, heart, and pear shapes. The finished blister pearl is then cut away along with the shell. Mabe pearls originate much like a blister pearl, but the removal from the mollusk is different. Instead of cutting away the shell with the blister, the blister is cut away from the shell, and the nucleus is separated from the blister. This leaves a delicate, hollow shape of nacre. The hollow space is then filled with epoxy or other type of filler and is capped with plastic or mother-of-pearl. This lends strength to the mabe and allows it to be set in jewelry. Mabe pearls commonly are set in rings and earrings. Seed pearls are tiny natural pearls. They can be round or irregular in shape and are generally less than 2mm in size. The quality of a pearl, either natural or cultured, is judged by many factors. These include luster, nacre, surface condition, shape, color, size and matching. Luster – This is the quality of the light reflected from a pearl’s surface and the pearls inner glow. It is thought by most to be the single most important factor in judging the beauty of a pearl, its value and visual appeal. The longer a pearl is allowed to grow, the thicker the coating of nacre around its center. It is this lustrous layering of crystals which traps and holds light that gives fine pearls their glow. The higher the luster the sharper the reflection and refraction of light. Luster would be described from high to low. Nacre Thickness – A pearl with very thin nacre still can have beautiful luster; however, the thickness of the nacre affects the durability and lasting beauty of the pearl. 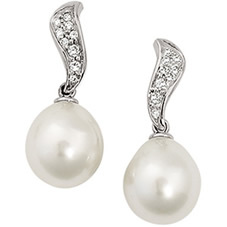 Surface Condition or Cleanliness – Like other natural gems, pearls may have some irregularities. The size, location, and quantity of these natural blemishes detract from the pearl's appearance. Cultured pearls with pits, spots, or ring-like markings will be lower in value than smooth pearls. Again, just as with faceted gems, the size, number, and type of marks or blemishes are important when determining the value of a pearl. Shape – Round pearls are prized over all other shapes. However, a round bead nucleus does not guarantee a round cultured pearl. Many pearls are nearly round and appear round from a distance once they are strung onto a necklace. 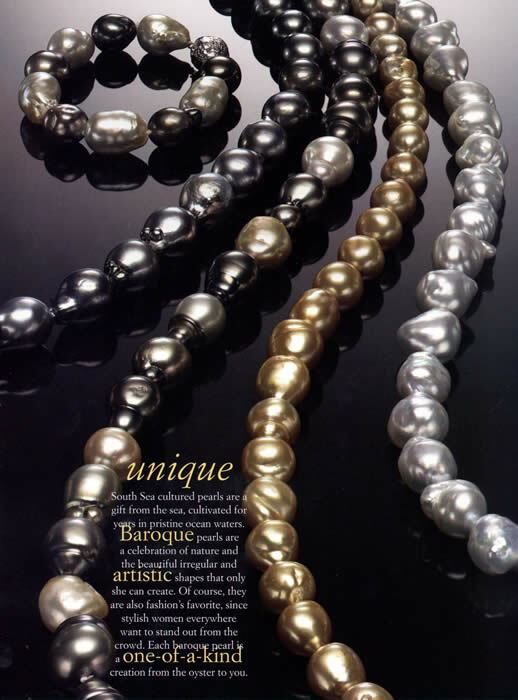 Irregularly shaped pearls are called baroque. Many people find the unusual shapes appealing, which command only a fraction of the price of round pearls. Pearls can also develop into other shapes. Three of the most common are the drop shape (similar to a pear shape), the oval, and the button (a flattened round). Color – The color of a pearl is determined genetically by the host mollusk. Different types of mollusks can produce pearls in many colors. The resulting pearl color can also be affected by water conditions, disease, or nutrient supply. Pearls usually exhibit both a body color and an overtone. Body colors include white, silver, cream, yellow (golden), gray, or black. The overtone is like a soft whisper of color over the body color – much like powdered blush over makeup. Overtone may be rose, green, blue, or violet. Size – Although size has nothing to do with the quality of a pearl, it can have a significant effect on its price. As mentioned before, Akoya pearls range in size from 2 mm to 10 mm. South Sea cultured pearls can range between 10 mm and 15 mm, and even larger. Tahitian pearls average 8 mm to 14 mm. And finally, freshwater pearls can be found in sizes between 4 mm and 10 mm. Matching - No two pearls are ever exactly alike. Most necklaces are the result of a careful blending of pearls that appear to look alike in respect to color, luster, shape, cleanliness and measurements. Matching peals is a fine art, add value to the necklace and is evident in beautiful pearls jewelry. Value Factors: Size, Shape, Color, Luster, Surface Quality; Nacre Quality, and Matching. Luster Grade: Excellent, Good, Fair, & Poor. Nacre Quality Grades: Acceptable, Nucleus Visible, or Chalky Appearance. What determines a pearl’s value? Ultimately, all the combined quality factors determine the value of each individual pearl of pearl strand. Most people would agree that luster is the most important value factor. However, the size will affect value too. With all other factors equal, the larger the pearl, the greater the value. And spherically shaped pearls have a greater value than irregularly shaped ones with similar characteristics. 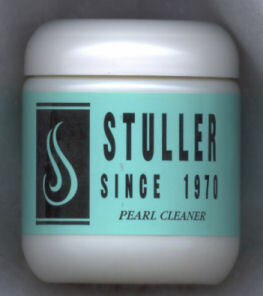 Do not let surface grime and film hide the beautiful luster of your pearls. It is wise to complete your beauty care before putting on your precious pearls. To keep them looking beautifully lustrous, wipe them with a soft damp (not wet) cloth. You can use our specially formulated pearl cleaning solution, or if they need a lot of attention, you can gently wash them in warm water and mild soap. Be sure to rinse the pearls well, lay them on a clean towel and allow them to dry completely. 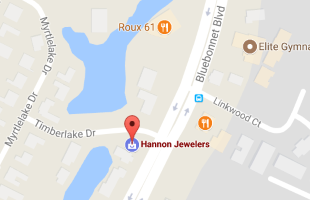 Also be careful with commercial jewelry cleaners. Many jewelry cleaners contain ammonia, which cannot be used on cultured pearls. Because washing and constant wear does weaken the necklace silk string, it is highly advisable to have your necklace restrung once a year. 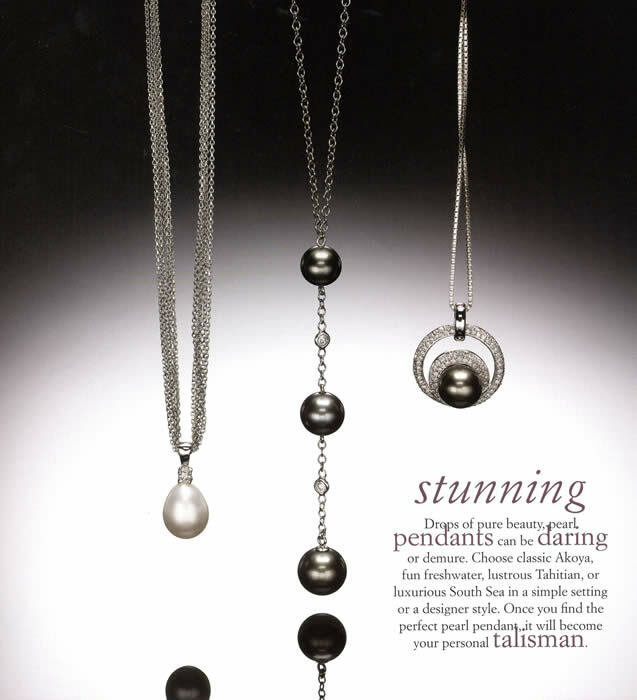 Hannon Jewelers cultured pearl necklaces are strung with a high quality silk thread for both strength and beauty. The silk thread is finely knotted between the pearls to protect them from rubbing against one another and also to keep the pearls from scattering, should the string break. Pearls are an organic, natural product. To avoid scratching them, keep you pearls separated from diamonds, other gemstones, and other metal jewelry.